Airport Operations: Reports IFR itinerant and VFR itinerant operations (arrivals and departures), and local operations at the airport as reported by Air Traffic Control Towers (ATCTs). It does not include overflights. Tower Operations: Reports IFR and VFR itinerant operations (arrivals and departures), IFR and VFR overflights, and local operations worked by the tower. TRACON Operations: Reports IFR and VFR itinerant operations and overflights worked by the TRACON. Total Terminal Operations: Reports total operations worked by any facility based on the functions at the facility. If a facility has a tower and a TRACON present, the Total Terminal operations is a sum of the Tower Operations and the TRACON Operations for that facility. Center Aircraft Handled: Reports domestic and oceanic departures and overflights and total aircraft handled by ARTCCs and CERAPs. Facility Information: Provides information about each air traffic control facility, such as facility name and type, region, state, hours of operation, etc. Delays: Provides information about the reportable delays provided daily through FAA's Air Traffic Operations Network (OPSNET). In 2008 the FAA revised the OPSNET methodology for reporting and tabulating air traffic counts and delays. The new methodology for reporting air traffic counts, which as was implemented on July 1, 2008, will improve the integrity and accuracy of traffic count reports. 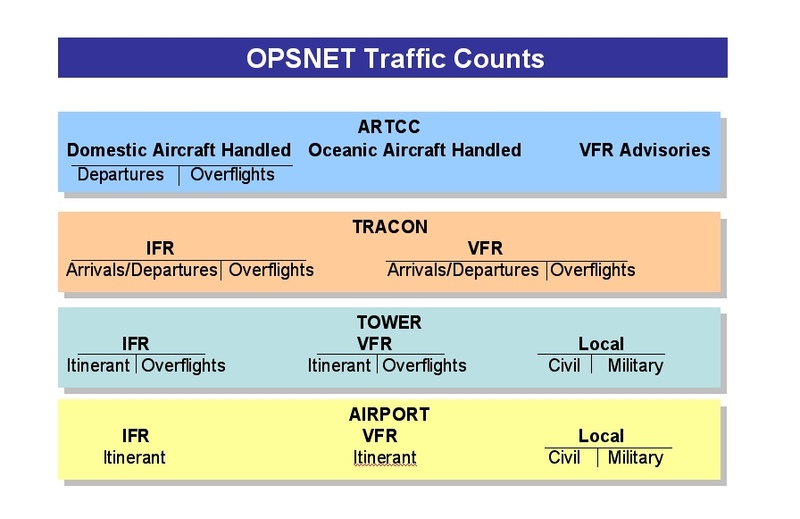 Historical OPSNET operations data dating back to FY 1990 have been converted to be consistent with the revised air traffic count reporting standards. •	The new reporting rules combine arrival and enroute delays into one category called “Airborne”. All airborne delays are now allocated to the ARTCC or TRACON where the delay occurred. In addition, the new reporting system also presents the number of airborne delays by destination airport. •	Departure delays resulting from Traffic Management Initiatives (previously referred to as TMS delays) are still allocated to the facility causing the delay but are displayed as “TMI To”. A column labeled “TMI From” has been added to display the number of TMI delays for the facility at which they occurred. •	The FAA now reports delays for aircraft which accumulate 15 minutes or more holding delay throughout the entire route of flight. Previous reporting rules recorded cumulative holding within each separate FAA facility. Each holding segment, for aircraft accumulating delay of 15 minutes or more, will be recorded as a delay. To allow for compatible comparison analysis, the historical OPSNET delay data dating back to FY 2000 have been converted to be consistent with the revised delay definitions. Airborne delays that were reported prior to October 1, 2008, which were allocated to airports and reported as “arrival delays” are now allocated to the ARTCC or TRACON that reported the delay. View the OPSNET Manual for a detailed explanation of how to create reports based on OPSNET. For more information about these topics, please see the Definitions of Variables for the OPSNET system.